So you’re an accomplished shade-tree mechanic, you love to save money by doing your own vehicle maintenance such as oil changes and tire rotation. You’ve accumulated a nice assortment of hand tools, and you have a spacious and well-lit garage. You are tired, though, of getting the vehicle’s jack out of the trunk every time you need to get under the car, and struggling with a scissors jack like you’d use to change a tire on the side of the road. It’s time to take the next step to a quick, convenient, and simple floor jack. 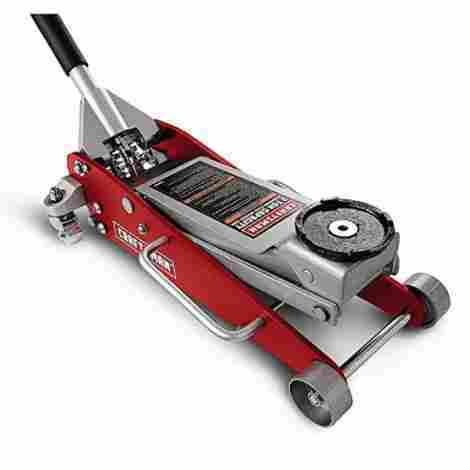 A floor jack is a device that rolls easily around your garage, slides under the vehicle, and usually has a hydraulic cylinder that you pump up using the jack’s handle (there are electric and air-powered versions as well, more on those later). The handle is also connected to a valve. Close the valve by twisting the handle to lift the car, open the valve by twisting the other way to release pressure and lower it. The advantage of a floor jack is it can be a one-hand operation, lifting the car with a few quick pumps. 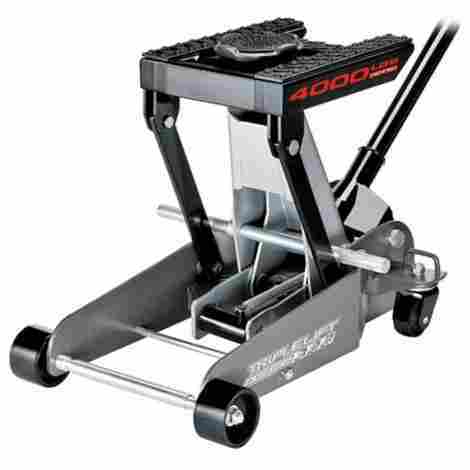 A floor jack is normally quite powerful, able to lift 4000 to over 7000 pounds! 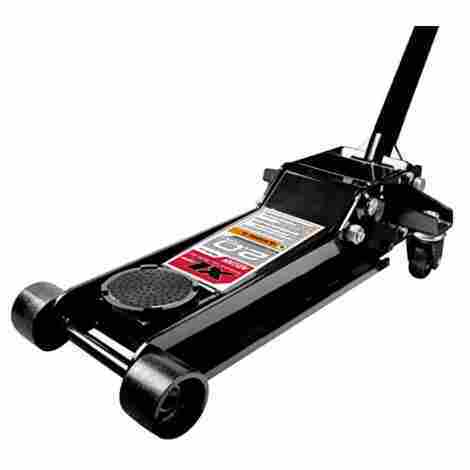 A floor jack can make even difficult garage tasks quick and enjoyable. We should mention that a floor jack is designed for lifting a vehicle, not holding it up for long periods while you work underneath. A good, stable set of jack stands is the best, safest option for that task. Once you get a floor jack, though, you will wonder how you ever worked without one before. Follow along now for our recommendations! The Arcan ALJ3T is rated to lift 3 tons – 6000 pounds! It weighs only 56 pounds due to its strong, aluminum construction. Its dual-pump hydraulic system means it lifts fast, and it lifts from 3.6” to 19.4”. At 31 inches long by 12-1/2 inches wide by 7 inches high, it won’t take up precious shop space. When choosing a floor jack, you must pick one with sufficient capacity for your needs. If you’re lifting a Fiat 500, that’s one thing, but a Ford F-350 is in another class entirely. Even if your daily driver is a small car, you never know what you may have in the future, or what you may be called upon to help your family, friends, and neighbors with. Lifting capacity is one specification where more is always better. This jack has a hefty 3 ton rating, sufficient for even larger vehicles. Bypass and overload valves in the hydraulic system ensure safe operation at all times. When lowering your vehicle, it moves smoothly and slowly, not dropping all at once. 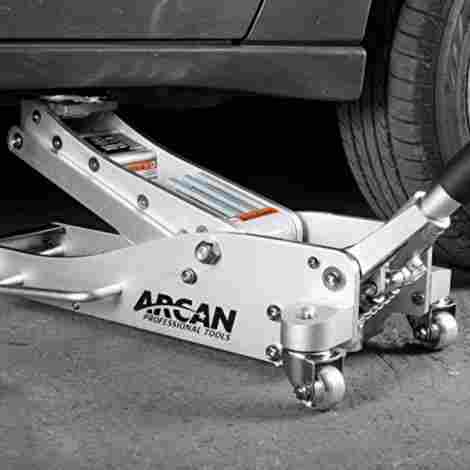 The Arcan ALJ3T meets strict Portable Automotive Service Equipment standards established by the American Society of Mechanical Engineers. The cost of this floor jack is in the upper range of the ones we reviewed, but certainly not the highest. Its features and capacity make it well worth its price. You’ll likely only make this purchase once, and at present-day prices, it will pay for itself after only a couple of oil changes. This floor jack is worth every penny, and easily claims the number one spot on our list. The JEGS 80077 is rated to lift 3 tons. It is constructed of lightweight aluminum, and weighs in at 58 pounds. It 32 inches long by 15 inches wide 8 inches deep. It includes a two-piece handle for easy storage and maneuverability. 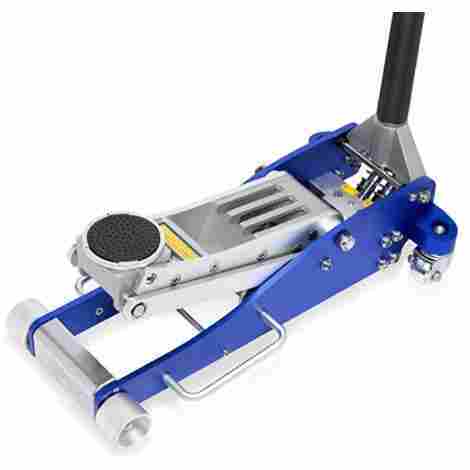 The JEGS 80037 3 ton floor jack is well-constructed of sturdy aluminum. The front wheels are strong and stable, while the rear wheels are on casters for easy handling. The minimum saddle height is 3-1/2 inches, good for low-clearance vehicles. The two-piece handle features a knurled grip to avoid slippage. A rubber lift pad is provided to prevent damaging your vehicle. Two convenient side handles ease placement and movement. This 3-ton capacity jack can handle almost any load you throw at it. At 58 pounds, it is more easily transported than heavier steel jacks of the same capacity. A sleeve on the handle helps protect your car’s finish. The 360-degree rotating saddle eases positioning under your vehicle. Hydraulic safety and bypass valves prevent using the jack beyond its rated capacity. This powerful, handy jack is sure to make your garage chores a pleasant experience! 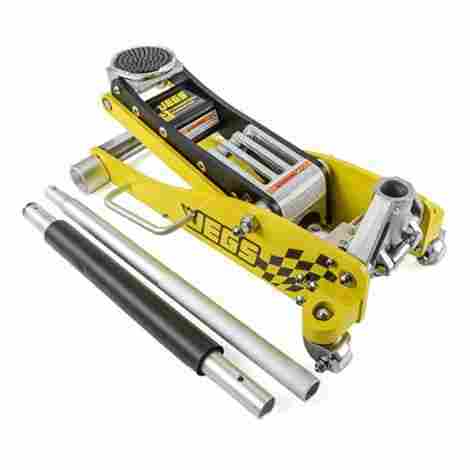 The JEGS 80037 3-ton floor jack is not cheap, but the quality and capacity make it well worth what you pay for it. All the features you desire in a floor jack are present, from the 3-ton capacity to the easy maneuverability. Purchasing this jack is the ticket to quick, enjoyable vehicle maintenance experiences. It comes in second on our list. The Pittsburgh Automotive 3 Ton Heavy Duty Floor Jack is another 6000-pound capacity jack. This jack is constructed of steel, and weighs 79 pounds. The minimum clearance is a low 2-7/8 inches. The dimensions are 28 x 12 x 10 inches. In third place on our list, the Pittsburgh Automotive 3 Ton is differentiated from the other two of our top three selections by its steel construction. That makes it heavier by almost 20 pounds than its competitors, but it is also much more inexpensive. Some may also feel the additional weight makes it a safer, heavier duty unit, though it is rated at 3 tons, just like the other two. 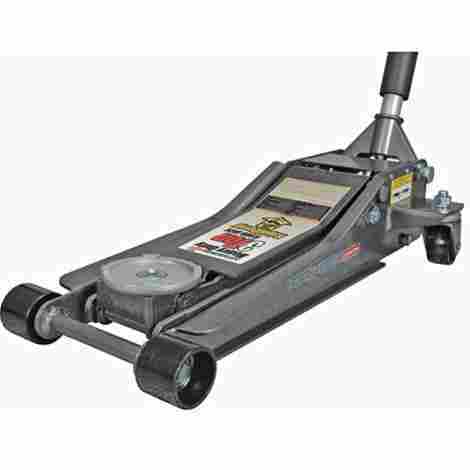 It does include a similar two-piece handle, which, combined with the steel casters makes this jack quite maneuverable. The low clearance helps this jack fit under very low clearance vehicles, while it is still of sufficient capacity to lift full-sized pickups and SUVs. Strong steel construction mark this jack as being as safe as any in its class. The Quick Lift Rapid Pump hydraulic system reduces the effort in raising your vehicle. The two-piece knurled steel handle provides a sure grip, while a foam sleeve prevents damage to your vehicle’s finish. The steel casters are extra-wide, providing good stability. The cost of this jack is markedly lower than others in its class, rendering it a great value. It is heavier, but if that’s not a consideration, then this may be the jack for you. Though relatively inexpensive, it is still provides excellent capacity and all the features you would expect in a quality floor jack. This Arcan product features the highest lift capacity of any listed here, 3-1/2 tons, or 7000 pounds. It is constructed of heavy, durable steel. Minimum clearance is a low 3-1/2 inches. It weighs 99 pounds, and its dimensions are 28 1/4 x 11 1/4 x 8 ½ inches. What sets this option apart from the others is its high capacity, 3-1/2 tons. The price paid is weight, nearly 100 pounds. If you truly need that extra lifting power, the Arcan XL35 Quick Rise Professional Service Jack may be the one for you. The rapid action dual-pump hydraulic pistons and long two-piece handle make your lifting task easier. Standard metal wheels and casters make this jack easy to maneuver into position. Rear ball-bearing casters swivel and roll easily. At low 3-1/2 inches, the minimum clearance is suitable for sliding under the lowest vehicle. High capacity and heavy construction mean this jack is tough and durable. The low clearance means it can be used under the smallest of vehicles. Bypass and overload valves prevent overextension or overloading. The swift rise with each pump of the handle means quicker, easier lifts. As always, use jack stands to support a vehicle once it is lifted. The price point for this jack reflects its heavy steel construction. Lighter aluminum jacks cost more and may be easier to handle for some. However, the high capacity of this lift per dollar spent to make it a great value. Anyone needing that extra capacity will be pleased with the features and price of this jack. The solid feel of a heavy jack will set your mind at ease even when lifting the heaviest cars or SUVs. The Neiko Pro 20272B Premium Low Profile Aluminum Floor Jack is a 3-ton capacity low profile jack. It weighs in at 57 pounds, has a minimum clearance height of 3-3/4 inches, and is 29 x 13 x 7 inches in size. The Neiko Pro 20272B Premium Low Profile Aluminum Floor Jack is an aluminum framed hydraulic jack, weighing in at a svelte 57 pounds. The low profile means it can start lifting from only 3-3/4 inches above the shop floor. Dual hydraulic pistons multiply the force exerted on the two-piece padded handle for rapid, easy lifts. Metal wheels and casters are very durable and allow for quick positioning. The blue and brushed aluminum colors make this an attractive addition to your garage. Standard for all hydraulic jacks, safety, and bypass valves prevent overextending or overloading the jack. A reinforced lift arm gives the user added peace of mind when lifting heavier vehicles. This jack presents a good value for its price. Like most aluminum jacks, it is more expensive than its steel counterparts, but on the plus side, it is much lighter. This particular jack was priced higher than very similar units, thus it is ranked a little lower on our top ten list. Still, it represents good value for the money as a high quality, fully capable tool. The Powerbuilt 620422E Heavy Duty 4000 lb Triple Lift Jack, as its name implies, a 2-ton capacity jack. Its unique triple lift design place it a different class, though, as does its wide lift area. This steel jack weighs 85 pounds, and its dimensions are 27 x 17 x 9 inches. The jack is constructed of steel. The Powerbuilt 620422E features a removable lift saddle as well as padded rails. This unique design allows this product to adjust to fit a number of different kinds of vehicle frames. There are built-in tie-down loops for securing motorcycles in place, and best of all, a locking bar that allows the jack to be locked in place when extended, a safety feature not found on any other jack we’ve reviewed. The lower limit of clearance is a relatively high (compared to our other choices) 5-1/4 inches. The wide carriage means that it is very stable. Very attractive from a safety standpoint is the locking bar feature. While we don’t recommend using any jack without stands, we feel this feature increases the safety value of this particular product. The capacity is lower than other options, but if you don’t need the higher rating, this is fine. The tiedown points for motorcycles are an important safety feature not usually seen in a floor jack. It is taller than most of its competitors, which may reduce its overall utility. The relative price of this product and its unique features combine to make this an excellent value. If you are aware of your needs and this product meets them, you can’t go wrong by selecting it. The Sunex XL20 is a 2-ton capacity steel-frame jack. It weighs 67 pounds and is quite compact. Its dimensions are 26 x 6.3 x 13.2 inches. It has a two-piece padded handle. 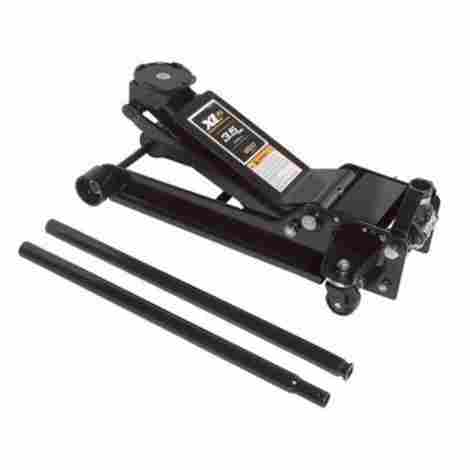 The Sunex XL20 Black Service Jack is another jack on our list of less than 3-ton capacity. That doesn’t mean it’s of any lesser quality, just that the components used in its design were purposely intended to function in a smaller, more compact jack that only has to lift up to its rating, 4000 pounds. As a result, it’s considerably less expensive than its higher capacity competitors. If you really don’t need that extra weight capability, why pay for it? Other than the lower weight rating, this jack includes all the features you’d expect in a good floor jack: low clearance to get under smaller vehicles, a two-piece handle, and metal wheels. The Sunex XL20 Black Service Jack is every bit as capable of doing its job as larger units. For safety’s sake, always remember to use it within its weight class. Its smaller footprint may make it a better fit for some home garages. The lower price point of this unit reflects its compactness and lesser weight capacity. That makes it a good value if it meets your needs; why pay extra for a 3-ton jack if all you’re lifting is your riding lawn mower? Still you should consider possible future needs when making a purchase like this, of an item that should last for many years. If budget is a high priority though, this jack may be just what you need. This product has a 2-ton capacity and is of standard design. It is of lightweight, yet strong aluminum construction, weighing in at 58 pounds. The dimensions are 28 x 13 x 7 inches. The minimum clearance height is 3-7/8 inches. The Craftsman name is synonymous with quality in the home garage. For that reason alone we are including this jack on our list. It does have all the features you would expect in a 2-ton jack: two-piece handle, safety and bypass valves, metal wheels, and swiveling casters. A smooth universal joint system on the valve allows for easy lifting and lowering from angles off center. 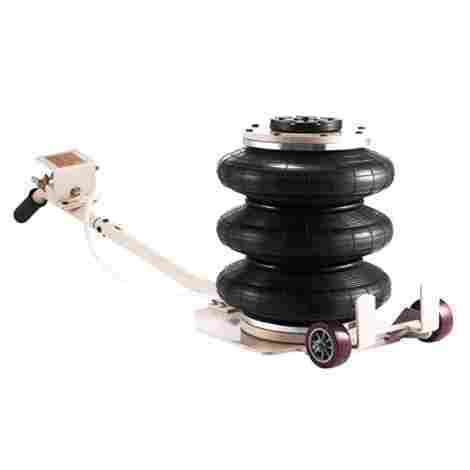 This product is easily maneuverable due to its relatively light weight. The safety and bypass valves insure the jack cannot be pushed past its design limits into unsafe territory. The Craftsman 2 Ton Aluminum Jack might have placed higher on the list but for its somewhat higher price when compared to similar units. However, if you are looking for a jack in this category, it’s a great choice. It will look great in any home garage, and its suitable for even professional use. 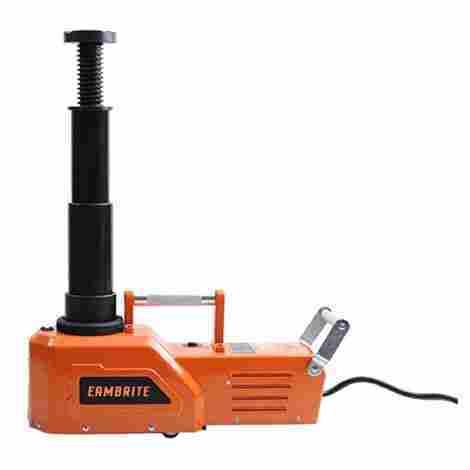 The EAMBRITE 12V DC is an electric/hydraulic jack;its hydraulic system is powered by an electric motor rather than your arm strength. It requires 12V DC power to operate. It is quite light at 27.5 pounds, and its dimensions are 15.4 x 4.8 x 8.3 inches. The EAMBRITE 12V is a unique entry on our list, claiming a place because of its electric power source and its capacity. AT 4.5 tons, it is the highest capacity option on our list. It’s quite light, at 27.5 pounds. It needs at least 8 inches of clearance to be positioned under your vehicle. It’s powered by 12VDC, meaning you can operate it from your vehicle’s own battery. It comes equipped with both a cigarette lighter plug and clamps to attach directly to your battery. At 4.5 tons capacity, this product has a lot of extra capability for lifting even the largest SUVs and pickups, or even an RV. The requirement for a power source beyond your own strength means it takes some extra time to deploy. The highest clearance requirement of all the jacks on this list, 8 inches, means it may not fit under smaller or low-profile vehicles. Still, the fact that it is relatively lightweight and powerful make this a good choice for many applications. This jack comes with a cigarette lighter plug, but it is not recommended for use because it may blow fuses in the vehicle. The much better (included) option is to use clips to connect directly to the battery. This is one of the more expensive options on the list, but it is also the highest capacity. That alone should make it worth consideration. The Mophorn 3-Ton is an air-powered option which needs an external air compressor to operate. It can lift 3 tons, weighs in at a relatively light 40 pounds, and its dimensions are 21 x 19.7 x 7 inches. The Mophorn 3 Ton is another unique entry on our list, being air-powered rather than hydraulic. The air comes from an external compressor which you must have for it to work. Its 3-ton capacity is adequate for even larger SUVs. The airbag design works by using air to inflate the powerful lifting bags. The lifting action can be quite rapid, and it does not require any tiring pumping with your arms. Safety valves protect against over-inflation. The frame is durable powder-coated steel. The Mophorn 3 Ton Triple Bag Pneumatic Air Jack requires 5 inches clearance to fit beneath your vehicle, slightly higher than similar capacity hydraulic jacks. It does require an air compressor to operate, which is an additional expense, but also a handy tool in your garage. The long handle and compact design make it easy to get in position and use. The cost of this is in line with other products of similar capacity. Its unique features might make it the perfect tool for your application. Assembling this list of floor jacks was not a simple task, due to the many variations on the market, and the close similarity of many products to each other. Even though they are similar, there are differences that become apparent on close side-by-side examination, and these differences are more than enough to boost one over another on our list. We list below the primary specifications we considered in including floor jacks on our list and placing them in order. The first consideration when looking at a floor jack is obvious: how much can it safely lift? This criterion is important enough that most of these products list this rating right in the product name. Weigh capacity is one figure where more is always better. If you have a small car in your garage, you might not need a larger jack, but you never know what life brings! Next thing you know, you have a few kids (or dogs, or you take up weekend trips to yard sales) and you’ve moved up to a mini-van or and SUV. Suddenly you need that extra lifting capacity! Of course, you may want a more compact jack to fit in your work area, and the lower capacity units are generally slightly smaller. Still, a lot of power in a small package is always a good thing. Of course, all these jacks are metal. The big difference is aluminum is used in some, and steel in others. Aluminum and steel are both equally strong, the difference between them is the weight involved. Aluminum jacks a quite a bit lighter in total weight, and this is a big factor in moving a jack around, either physically carrying it from place to place or rolling it along the floor. Steel jacks are quite heavy in comparison, though this tends to make them want to stay put. Aluminum jacks are usually more expensive that steel jacks, and this is where the trade-off lies. If you want the light, strong, aluminum jack, you may pay a few more dollars for it. If you want the tough steel jack, you might save some of your hard-earned cash. The weight of the jack almost always is dependent on the material used in its construction and its weight ratings. As we discuss above, steel is heavier than aluminum; a higher capacity jack is usually heavier than a lesser one. Once you zero in on your needs, the weight may be the next criteria to consider. For most of us, a lighter jack will be better than a heavier one, in terms of moving, using, and storing it. But if you are ok with the extra weight, the steel jack may be just fine, and save you money, too. We have, however, generally rated lighter jacks higher than heavier ones of the same capacity. The physical size of a jack is important, though there are trade-offs here as well. A small jack is easy to maneuver, and easy to store. A large jack can usually lift more. Are you going to be moving it from place to place? If so, a smaller unit that is easier to fit in your vehicle may be the best choice. A small jack may not be as stable as a larger one as you lift, however, and the last thing you want is your jack tipping with several thousand pounds of valuable vehicle on it. The ones on our list are going to be very stable and safe. Looking around the marketplace, however, we find there is a great deal of variation out there, and the physical size of a floor jack is an area you will want to give some thought to as you make your purchasing decision. The minimum clearance of a jack is one of its most important specifications. That will tell you the lowest height the jack will fit under. If your jack won’t fit under your car, it is not going to be very useful! Many of the jacks we rate highly will fit in a space around 3-1/2 inches; perfect for that Ferrari in your garage! You can always place a wood block on the lifting saddle of your jack if you need to lift something higher, like that Land Rover parked by the Ferrari. You can’t, however, shrink a tall jack to fit. You’ll want to know your requirements when you shop, but a low-profile jack will probably be the best choice. The overall ease of use reflects the ergonomics and physical effort required to use a floor jack effectively. Does it rise quickly when pumped? Is it easy to carry, move, position, and deploy? This another category where lighter jacks have an advantage, but of course, the capacity is important and is a first consideration. A jack may be easy to use, but if it’s not up to the task, it will not be a good match. This is also why we include the two powered entries on the list. One is electric, one is pneumatic, and what could be easier than pushing a button and watching them do the work? The simpler arm-powered units don’t require much setup or additional equipment though. As in all of the criteria, simply usually means better. Last of all we considered price as a factor in judging these floor jacks. Where very similar products of high quality exist, we generally give the nod to the ones at a lower price-point. You work hard for your money (after all, you are buying a tool to work on your vehicles!) and deserve the best you can get for the money. As mentioned before, the more capable the floor jack, generally the higher the price. But similar jacks, say 3-ton units, have prices variations when looked at side-by-side. We, just like you, like those that are less expensive while still providing the same utility. Closing out our list of the 10 best floor jacks, we’ll try to answer some common questions about these pieces of equipment. Though they all accomplish the same thing, there are enough variations in form and function to generate quite a few questions in most people’s minds. Use and maintenance are always thoughts that consumers have as they consider different products. Below are answers to common questions that came up in our minds as we developed this list. Q: OK, so what IS better, aluminum or steel? A: The definitive answer is: it depends. Both materials are strong, durable metal. When an aluminum can comes to mind, you might think of something thin and flimsy. Not so with an aluminum floor jack, the aluminum alloys used are very light, yet very strong, and the thickness is such that it can bear up to the weight it needs to carry. Steel, is strong, but heavier. Steel nay also rust, though the steel of a floor jack sidewall is so thick that it would take decades of rust to weaken it. Rust may just be an appearance issue. Steel is cheaper than aluminum, though and that is usually the only consideration, price-point. Q: Do they need maintenance? A: Very occasionally. A simple, hand-pumped floor jack is typically ready to use right out of the box, and will stay ready for many years. The usual way of maintaining shop equipment – lubricating joints, keeping it clean, wiping up spills, and putting away out of any area where it might be physically damaged is enough. Just keep a good shop towel on hand and give it a wipe! Sometimes the hydraulic system needs work, ranging from simple bleeding (removing air that enters the hydraulic system lines or cylinder) to replacing seals or o-rings. The good news is there are usually commonly available generic parts, and replacement hydraulic oil should as close as the nearest hardware or auto parts store. If you have a floor jack, you probably are a frequent visitor there! Q: Is it alone enough or should I use stands? A: Anytime you are going to raise your car for any length of time, or are going to get under it yourself, use jack stands! If you are doing a simple task like changing a tire, where you are not under the vehicle, you could raise it with your floor jack, change the tire, and lower it again. But if you are under it changing oil, or transmission fluid, or any of the myriad tasks that need doing to keep your car in tip-top shape, then support it on good quality jack stands. The single lifting point of a floor jack is not as stable as two or more jack stands, and something in the floor jacks hydraulic system could conceivably fail, bringing the car down rapidly on your most precious possession: your own body. Q: My jack won’t lift high enough for my needs, can I add a pad to lift higher? A: You may add material atop the floor jack saddle so it will lift higher. The best choice is solid wood – 2×4 or 4×4 lumber. There are other materials available, some are sold commercially especially for this task. Some mechanics use hockey pucks on the floor jacks. Always consider the safety and security of whatever you use. Q: Where is the best location on my vehicle to lift? A: Consult your vehicle’s owner’s manual for lift points. Most vehicles have particular points that are reinforced or engineered to properly support the vehicle and not allow it to twist or flex. You may need an adapter to use your jack at a pinch weld point, these look like a flange of metal sticking up underneath your car. A pinch weld adapter will have a slot to allow the car to be lifted without crushing the metal flange. Q: Can I lift more than the rated capacity? A: Very likely you can. But don’t. You risk damaging the floor jack itself and hurting yourself. While the manufacturers design in safety margins, you don’t want to become an accidental test subject! Like all tools, use it as it’s intended to be used and you will get years of good service out your floor jack. Remember, the life you save may be your own!